It’s currently set to run for three-and-a-half hours, plus a preceding one-hour red carpet show on NBC. 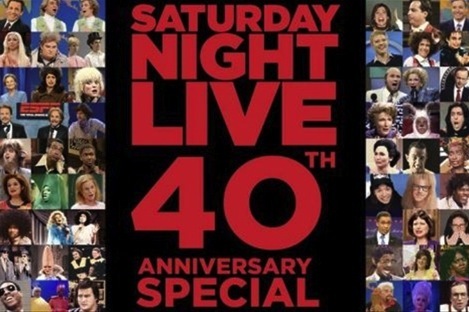 Live from New York, it’s the Saturday Night Live 40th Anniversary Special -- on a Sunday from 7 to 10:30 p.m. (central). Your friendly content provider has lived through it all, starting in fall 1975 as a graduate student at the University of Wisconsin-Madison. First time I laughed until almost puking: watching John Belushi fake-choke on a big hunk of chicken while feeding his face as Elizabeth Taylor on a segment of “Bill Murray’s Celebrity Corner.” It probably helped being high at the time. Sunday’s milestone SNL event is so big that even Eddie Murphy is scheduled to show up. He’s long been estranged from the show and was the only major cast member who refused to participate in the terrific oral history compiled in 2002 by Tom Shales and James Andrew Miller. The following is a random list of odds, ends and opinions -- all of them in no particular order. But before we begin, I strongly recommend that you download the brand new, free SNL app, available via AppStore.com/SNL. I began test-driving it Thursday. And while not every sketch is available, some 5,500 of them are. It’s quite a treasure hunt, with cast members listed chronologically season-by-season. Click on Bill Murray, for instance, and you can watch 24 sketches in which he appeared. I’m sure they’ll be adding more as the app blooms and grows. WE REGRET TO INFORM YOU THAT THE FOLLOWING CAST MEMBERS WILL NOT BE ATTENDING SUNDAY’S SPECIAL -- RIP John Belushi, Gilda Radner, Phil Hartman, Chris Farley, Jan Hooks, Tom Davis, Michael O’Donoghue, Charles Rocket and Danitra Vance. CAST MEMBER WHO’S GONE ON TO HAVE THE MOST GAINFUL TV CAREER -- I have to go with Julia Louis-Dreyfus, who’s since won acting Emmys for her roles in NBC’s Seinfeld, CBS’ The New Adventures of Old Christine and HBO’s ongoing Veep. CAST MEMBER WHO’S GONE ON TO HAVE THE MOST GAINFUL MOVIE CAREER -- For longevity and quality of roles, my choice is Bill Murray. He’s still on the prowl for offbeat, interesting acting challenges after memorializing himself in Caddyshack, Groundhog Day, Stripes and Ghostbusters. YOU’VE PERHAPS FORGOTTEN THAT HE WAS ONCE A CAST MEMBER -- Robert Downey, Jr., who hung in there for Season 11 (1985-’86). ODDEST FIT FOR A PRESIDENTIAL IMPERSONATION -- Randy Quaid, who also was part of the Season 11 cast, became the go-to guy for Ronald Reagan sendups. Underrated Terry Sweeney fared much better as wife Nancy. ALL-TIME MOST VALUABLE CAST MEMBER -- It’s a tough choice from among my Big Three of Dana Carvey, Will Ferrell and Phil Hartman. Each could mimic almost anyone while also bringing their own new characters to prominence. But in the end, I’ll take Carvey. He nailed George H.W. Bush, Ross Perot and Johnny Carson among others while also creating The Church Lady; Hans of Hans and Franz; and Garth Algar in the numerous “Wayne’s World” sketches and subsequent feature films. WORST FILM STARRING A SKETCH CHARACTER -- Julia Sweeney’s 1994 It’s Pat emerges as the mega-stinker. MOST UNDERRATED MIMIC -- I’ve made fun of him over the years, primarily because he’s basically gone on to do nothing after reigning as SNL’s biggest star with Eddie Murphy in Seasons 7-9. But Joe Piscopo had a strong string of impressions, most prominently Frank Sinatra but also including Andy Rooney, David Letterman, Ted Koppel, Dean Martin, Dan Rather and Ronald Reagan. SKETCH I COULD WATCH A GAZILLION TIMES -- Rachel Dratch cracking up the cast and herself as Debbie Downer in a May 1, 2004 sketch built around a family reunion at Disney World. Jimmy Fallon and Horatio Saenz were especially vulnerable. HALL OF FAME HOST WITH THE MOST -- Steve Martin. Always brings it. BEST WEEKEND UPDATE ANCHOR TEAM -- Tina Fey and Amy Poehler. CAST MEMBER WHO LASTED THE LONGEST WITHOUT LEAVING ANY LASTING IMPRESSION DURING OR SINCE -- Melanie Hutsell, who joined SNL in Season 17 and lasted through Season 19. BIGGEST OPEN QUESTION -- Will former SNL host Brian Williams be allowed to attend? And if so, will he have to watch from the shadows so as not to be caught on camera and create a “distraction?” A six-month unpaid suspension is one thing. But barring Williams from this historic event on his home turf might be the worst punishment of all for him.